Half Marathon: An Applied Approach to Health Psychology! In early December when some of the MSc Health Psychology students first mentioned that they were planning to do the Merthyr half marathon on 22nd March and asked me if I would join them, I had no hesitation in firmly declining their invitation. I am not a runner, never have been and had no intention of starting at this stage in my life. However, as I heard more of their enthusiastic plans and training schedules and realised that they had built the whole idea around the ethos of health psychology I was impressed by their initiative and dedication to the challenge. 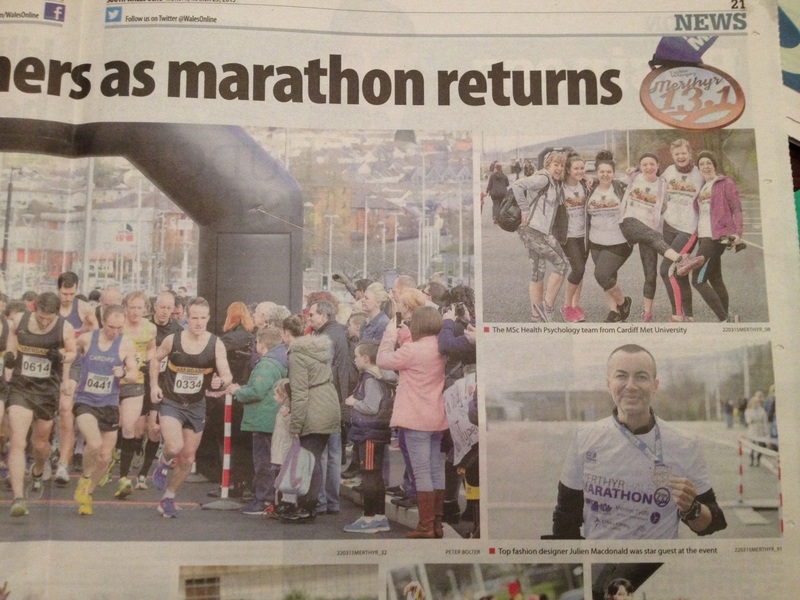 The choice of Merthyr Tydfil as the location for completing the half marathon emanated from the reports of low levels of healthy life expectancy in certain parts of the town, which are largely attributable to the lifestyle behaviours and attitudes that health psychologists are trained to understand and endeavour to change. The students also decided to use the half marathon as a vehicle to raise money for Diabetes UK, a charity which supports and campaigns for people with the chronic and potentially life threatening condition that gave the organisation its name and again has links to the lifestyle choices that are increasingly common in the UK today. 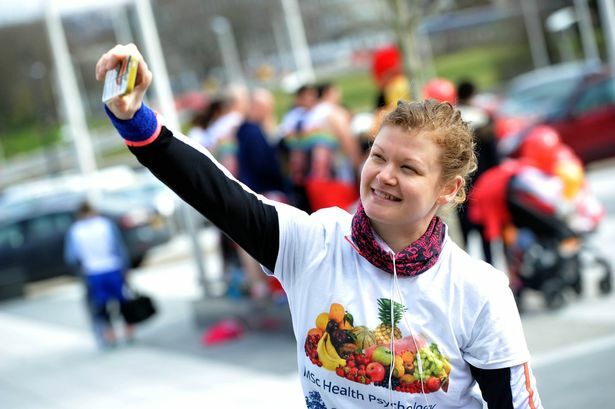 As a third prong to the health psychology focus, training for and completing the half marathon was seen as a motivation for the students themselves to take more exercise and develop healthier habits, including losing weight and giving up smoking. I’m still not quite sure how I became persuaded to take part in the half marathon myself but having made the decision I downloaded an 8 week training programme in January. It was great to listen to all the advice and comments from the students: how to hold your hands when you run; what to eat when you are training; what to wear etc. Also they were very forthcoming with their encouragement, which was fantastic. However when I looked up advice on the internet on how to train for your first half marathon in middle age I found lots of sites designed for people in their mid-thirties! Since I have children who are that age, that was rather dispiriting, as were the in depth descriptions of what happens to the heart, lungs and arteries of ‘older’ people which prevents them from running so well or recovering so effectively. I started towonder if I was suffering from some form of delusion to even imagine I could embark on this venture. What had I been thinking? Had I forgotten that most of the students are less than half my age? 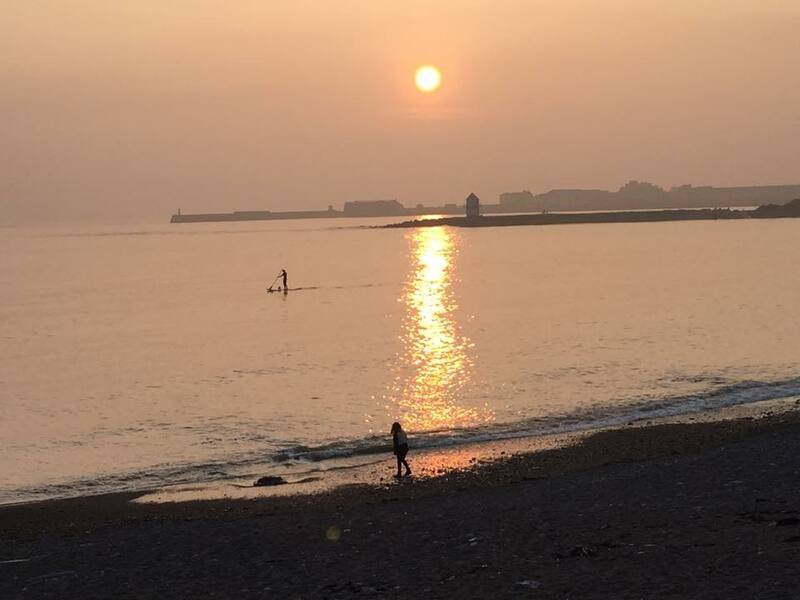 Despite my lack of enthusiasm for running and my resentment at having to devote so much time to monotonously planting one foot in front of the other for increasingly long periods of time as the training progressed, the fact that I live close to the sea and so was able to run along the coastal path made it a lot more bearable. After a day of sitting in front of a computer the prospect of getting home and setting off in the fresh air among the sights and sounds of the beach front became something I even looked forward to on occasion – at least while the runs were still at the level of 2 or 3 miles. I experienced a lot of ups and downs throughout my 9 week training period, achieving further distances and faster speeds were important to build confidence, but then there would be off days or periods of total exhaustion when I struggled to complete just a few miles and so found it impossible to imagine ever completing over 13 miles. Fortunately on the day of the half marathon I felt rather more positive about the whole experience that was to come. To some extent I was demob happy already, enjoying the anticipation of lounging around and feeling self-congratulatory once the event was over. A feeling of confidence coupled with a healthy dose of denial meant that I was almost looking forward to the event by the time I arrived to register on Sunday morning and it was amazing to feel part of something exciting and challenging alongside the students. The novelty of the experience made it really interesting and with the range of ages, abilities, experience and aspirations among the students it was fantastic to see how they supported each other, and in some cases even sacrificed their own, all important finishing time in order to ensure their friends were okay and not left on their own. We were very lucky with the weather, the sun was shining and there was no significant wind or rain. The cheers and shouts of encouragement from people lining the route was really uplifting, especially a young child of about 10 calling forcefully to tell runners ‘you’re doing really well, not far to go now.’ The momentum of the other runners, almost pulling me along in the throng, made the run easier than I could ever have anticipated. I was dreading the final few yards as they involved two circuits of the car park, apparently in order to provide photo opportunities! However it was great to hear the cries of those gathered at the carpark to welcome the survivors back to where they had started. I was delighted to be close to the end of the run and the word ‘FINISH’ was the most welcome word I have ever read. I was disappointed to find that the organisers of the half marathon had run out of medals by the time I finished, as apparently only half of those they ordered had been delivered. But at least I had the t-shirt and have been promised that a medal will be sent to me in the post. Most importantly I had succeeded in a challenge that I had on many occasions thought would be beyond my capability; gone from being unable to run a mile to running almost all of a 13.1 mile half marathon after just 9 weeks of training; become fitter than I would ever otherwise have done; and developed a habit of regular health promoting and health sustaining exercise that I will continue for the long term. When people ask me if I enjoyed the experience, I almost think the answer to that may be ‘yes’, but did I enjoy it enough to want to ever do it again? I’m afraid the answer is a very clear and immediate ‘no’. But I’m incredibly pleased to have done it once and to have been able to share the experience with the students, many of whom are already looking forward to the Cardiff half marathon in October and benefiting from the free places provided for staff and students by Cardiff Metropolitan University.